Hakusan, Japan, October 31, 2017 – EIZO Corporation (TSE: 6737) today announced the introduction of two new surgical LCD monitors for displaying endoscopy and operating microscope feeds. The two models are the CuratOR EX3220 and EX2620 – 31.5-inch and 26-inch full HD (1920 x 1080) surgical monitors designed and manufactured by EIZO. In June 2017, EIZO announced its entry into the surgical and endoscopy business with its first 3D surgical monitors. With today's release of two new 2D surgical monitors, EIZO aims to flexibly respond to the various user needs in the surgical and endoscopy market. 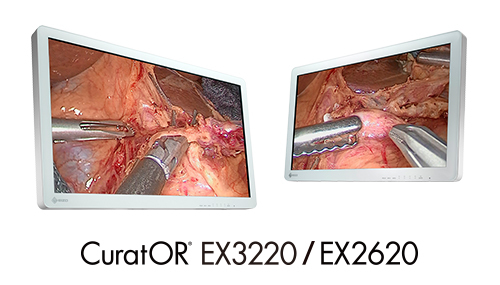 The EX3220 and EX2620 faithfully reproduce surgical images with high definition, brightness and contrast. The EX3220 has a maximum brightness of 650 cd/m2 and a contrast ratio of 1400:1, and the EX2620 has a maximum brightness of 700 cd/m2 and a contrast ratio of 1400:1. The monitors are designed with safety and hygiene in mind. They feature rounded corners to prevent injury when moved around the operating room, and they also feature a fully flat design which has protection against foreign material and splashes to a level of IP45 on the front and IP32 in entirety. Furthermore, they use a unique heat dissipating system which does not require a fan, meaning that the monitors are quiet and do not interfere with airflow in the operating room. Additionally there are no ventilation holes, meaning that cleaning and disinfection can be done safely and efficiently without damaging the monitors. They can also contain cables neatly in the supplied cable cover for safe and hygienic use. EIZO will continue to expand on this new line of surgical monitors with varying resolutions and sizes, to respond to the diversifying needs of the healthcare industry. The below links will redirect you from the EIZO global website to the EIZO OR website. The CuratOR EX3220 will begin shipping in January 2018. The CuratOR EX2620 will begin shipping in February 2018. Date of availability varies by country so contact the EIZO group company or distributor in your country for details. EIZO (TSE:6737), which means image in Japanese, is a visual technology company that develops and manufactures high-end display solutions. EIZO integrates hardware and software technologies with consulting, web hosting, and other services to help customers in business, graphics, gaming, medicine, maritime, and other fields work more comfortably, efficiently, and creatively. Headquartered in Hakusan, Japan, EIZO has R&D and manufacturing facilities in Japan, China, Germany, and the US, and representation in more than 80 countries. For more information, please visit www.eizoglobal.com. All product names are trademarks or registered trademarks of their respective companies. EIZO and CuratOR are registered trademarks of EIZO Corporation.